ManyÂ middle-class South Africans who grew up in the townships have fond memories of the kota. For them, it is almost a rite of passage, something you have to experience as you struggleÂ through life. For some, the kota is like pap and amagwinya, an integral part of what it means to be a black South African. So when a beloved and popular meal amongst the poor and working class is turned into a cheap commercial venture by a corporate South African food giant, it is understandable why people are outraged. Gugulethu Mhlunghu called for the fast food chain to explain their latest creation. And, Debonairs ended up being the most talked-about brand on Twitter in South Africa for several hours. Most people were disgusted, accusing the fast food chain of appropriating and disrespecting black culture. 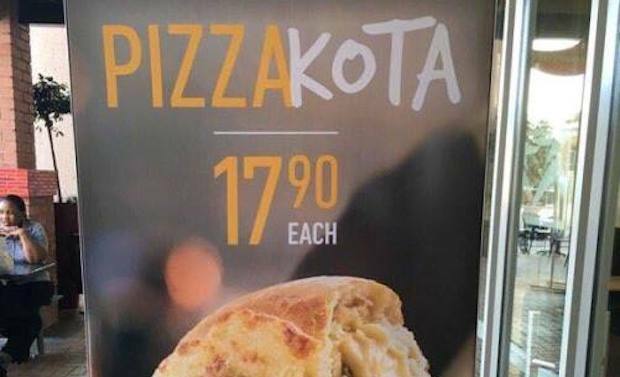 Debonairs pizza kota!? Tf!!!! Who come up with such things?…what's in that kota? Chips+atchar+special? Is there a Fast Food Ombudsman we can report Debonairs and Nandos to? @ThuliMadonsela3 @SAPresident @POTUS @Pontifex Please help us guys!!! 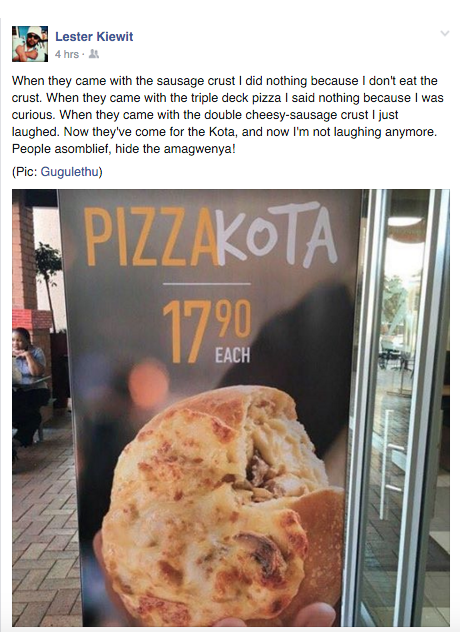 Others pointed out thatÂ the PizzaKota is the latest in a series of unimaginative food inventions from Debonairs. Despite the criticisms, there are a few who look forward to the PizzaKota. What do you think of this latest invention? Let us know in the comments or tweet us @thedailyvox! Philip Owira is completing his masters in African politics at the School of Oriental & African Studies, University of London. What’s a bunny got to do with Easter anyway? “Think of the kota as an evolving township street food burger.â€ says Vuyo Mpantsha. His words indicate that the food has changed over time. Perhaps this could be the next stage in the evolution? The natural selection I have in mind is a crude distortion of the scientific concept but here natural selection means that naturally, people just choose the Debonair’s Kota. People need to calm down. If the market enjoys the Debonair’s Frankenstein Kota, then it will succeed and may become the future of fast food. If people dislike it, there will be insufficient demand and it will eventually die … like the other foods in the junk food cemetery. Debonairs Pizza is always looking at new ways to satisfy their customers. Thatâ€™s why we recently decided to trial a new product – the Pizza Kota. This tasty innovative product is in celebration of one of South Africa’s most loved foods. This product was never meant to offend our customers but rather to celebrate the diverse culture in South Africa. The Pizza Kota uses pizza dough, baked into a burger-sized, dense bun with a cavity in the middle that is filled with pizza topping ingredients. In our initial development stages the feedback we received was positive as the customers described it as a satisfying snack that reminded them of a Kota or a Bunny chow, hence the name. We welcome all feedback (positive and negative) and will keep adapting our offerings to give consumers what they want.